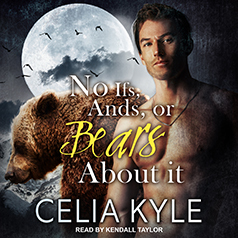 Celia Kyle presents the first book in her Grayslake: More than Mated series. The first day of Mia's new life in Grayslake, Georgia, is not going as planned. The house her grandfather left her looks ready to crumble, boxes cover every inch of the floor and—oh—there's a bear cub in her pantry. It gets worse when the cub's uncle comes by and busts out his fur and claws while on her front porch. Then it gets loads better because suddenly there's a hot hunk of badge-wearing werebear on her lawn ready to rescue her. Yum. Of course, he has to ruin things by trying to take the cub out of her hands. Ha! The cub is hers . . . No ifs, ands, or bears about it. Werebear Ty can't seem to get the curvaceous, delectable Mia to understand that, even if she is one-quarter werebear, she isn't keeping the cub. Ty is the Grayslake Itan, the clan's leader, and the little werebear is going home with him . . . Unless it isn't. It's her smile. If she'd stop smiling and being gorgeous, his inner-bear would support him and Ty would get his way. But the beast wants to make their woman happy, so it's perfectly content to let her do as she pleases. Then things change. Threats arise, danger comes close, and Ty demands she return to his den. No ifs, ands, or mates about that. "Ms. Kyle hit a home run with this adventurous paranormal romance!" ---From Me to You . . .